1-21: The fifth angel sounded his trumpet, and I saw a star that had fallen from the sky to the earth. The star was given the key to the shaft of the Abyss. When he opened the Abyss, smoke rose from it like the smoke from a gigantic furnace. The sun and sky were darkened by the smoke from the Abyss. And out of the smoke locusts came down upon the earth and were given power like that of scorpions of the earth. They were told not to harm the grass of the earth or any plant or tree, but only those people who did not have the seal of God on their foreheads. They were not given power to kill them, but only to torture them for five months. And the agony they suffered was like that of the sting of a scorpion when it strikes a man. During those days men will seek death, but will not find it; they will long to die, but death will elude them. The locusts looked like horses prepared for battle. On their heads they wore something like crowns of gold, and their faces resembled human faces. Their hair was like women's hair, and their teeth were like lions' teeth. They had breastplates like breastplates of iron, and the sound of their wings was like the thundering of many horses and chariots rushing into battle. They had tails and stings like scorpions, and in their tails they had power to torment people for five months. They had as king over them the angel of the Abyss, whose name in Hebrew is Abaddon, and in Greek, Apollyon. The first woe is past; two other woes are yet to come. The sixth angel sounded his trumpet, and I heard a voice coming from the horns of the golden altar that is before God. It said to the sixth angel who had the trumpet, "Release the four angels who are bound at the great river Euphrates." And the four angels who had been kept ready for this very hour and day and month and year were released to kill a third of mankind. The number of the mounted troops was two hundred million. I heard their number. The horses and riders I saw in my vision looked like this: Their breastplates were fiery red, dark blue, and yellow as sulfur. 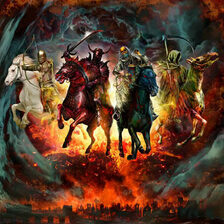 The heads of the horses resembled the heads of lions, and out of their mouths came fire, smoke and sulfur. A third of mankind was killed by the three plagues of fire, smoke and sulfur that came out of their mouths. The power of the horses was in their mouths and in their tails; for their tails were like snakes, having heads with which they inflict injury. The rest of mankind that were not killed by these plagues still did not repent of the work of their hands; they did not stop worshiping demons, and idols of gold, silver, bronze, stone and wood--idols that cannot see or hear or walk. Nor did they repent of their murders, their magic arts, their sexual immorality or their thefts. Futurists see the events described in chapter 9 as yet to be fulfilled in the future. Some Futurists see the falling star as a literal star whereas most see it as Satan or a representative of Satan descending to open the pit of hell to release demons upon the earth which are represented by locusts. Some see the locusts as armies of men influenced by Satan and the demons. Some Futurists see in this passage fulfillment of Ezekiel 38 where Gog and Magog release great military power against the land of Israel. Gog and Magog are felt to refer to the modern nations of China and the Soviet Union. The recent breakup of the Soviet Union may do damage to this perspective. The king over the locusts is felt to be Satan which in turn indicates the locusts are either demons or demon possessed humans. Releasing of the four angels bound at the Euphrates is seen as the release of a great army in the east to descend upon Israel. Some Futurists see the number of the mounted troops of two hundred million as figurative of a large army. It is pointed out that the former Soviet Union had an army of around three million and China’s army is around 2.3 million. An army of two hundred million would surpass the combined armies of every nation of the world. Some futurists believe the two hundred million refers to demons. Most Futurists see the descriptions presented here as representative of modern weaponry. Failure of the human race to repent after such great devastation is felt to reflect the great influence of demonic control over the world and its population. Preterists see the events of chapter 9 fulfilled in conditions extant in first century Israel just prior to and during the war with Rome. Preterists see the falling star and release of the locusts as representative of demonic activity that had taken control in Israel during this period of time. Much death and destruction was caused by Jews fighting Jews before the full brunt of the Roman invasion occurred. Historians such as Josephus show virtual anarchy in Israel prior to their destruction. Preterists believe this fulfilled what Christ prophesied as recorded in Matthew 12. Matthew 12: 43-45: "When an evil spirit comes out of a man, it goes through arid places seeking rest and does not find it. Then it says, `I will return to the house I left.' When it arrives, it finds the house unoccupied, swept clean and put in order. Then it goes and takes with it seven other spirits more wicked than itself, and they go in and live there. And the final condition of that man is worse than the first. That is how it will be with this wicked generation." Some Preterists see the locust’s five month period of activity corresponding to the five months the Roman armies surrounded Jerusalem before actually entering the city. Historians show this phase of the Roman siege of Jerusalem began on the 14th. of Nisan (April) of A.D. 70 and ended on the 8th. of Elul (September) A.D. 70., a period of 134 days which is just short of a normal five month period. The inhabitants of Jerusalem held out against the Romans during this five month period while suffering greatly from internal strife and starvation. In this case the king over the locusts is felt to be the Roman general Titus. The release of the four angels at the Euphrates representing the mounted troops is seen as invading Roman legions and their allies coming against first century Israel. Josephus records that the 10th legion which participated in the attack had been stationed near the Euphrates. Some Preterists see in this passage fulfillment of the final curses upon Israel for their failure to obey the Covenant (see Deuteronomy 28:49-68). The number of two hundred million is seen as figurative. Preterists see Israel’s refusal to repent as reflective of having given themselves over to demons as Christ predicted would happen. The Roman general Titus repeatedly offered the Jews opportunity to surrender and avoid total destruction but they refused. 1-11: Then I saw another mighty angel coming down from heaven. He was robed in a cloud, with a rainbow above his head; his face was like the sun, and his legs were like fiery pillars. He was holding a little scroll, which lay open in his hand. He planted his right foot on the sea and his left foot on the land, and he gave a loud shout like the roar of a lion. When he shouted, the voices of the seven thunders spoke. And when the seven thunders spoke, I was about to write; but I heard a voice from heaven say, "Seal up what the seven thunders have said and do not write it down." Then the angel I had seen standing on the sea and on the land raised his right hand to heaven. And he swore by him who lives for ever and ever, who created the heavens and all that is in them, the earth and all that is in it, and the sea and all that is in it, and said, "There will be no more delay! But in the days when the seventh angel is about to sound his trumpet, the mystery of God will be accomplished, just as he announced to his servants the prophets." Then the voice that I had heard from heaven spoke to me once more: "Go, take the scroll that lies open in the hand of the angel who is standing on the sea and on the land." Ephesians 3:4-6: In reading this, then, you will be able to understand my insight into the mystery of Christ, which was not made known to men in other generations as it has now been revealed by the Spirit to God's holy apostles and prophets. This mystery is that through the gospel the Gentiles are heirs together with Israel, members together of one body, and sharers together in the promise in Christ Jesus. The action of eating the little book is seen as reminiscent of Ezekiel eating a scroll which was sweet in the month but left a bitterness. This event was associated with judgement of Judah in the destruction of Jerusalem at the hands of the Babylonians (Ezekiel 3:1-3, 14). Preterists now see Jerusalem being destroyed for its failure to embrace the covenantal change that Christ brought. Some Futurists see the mighty angel as Christ. Others see the angel as representative of Christ. Futurists have little definitive to say about the meaning of the little book. Some Futurists see the mystery of God as His allowance of Satan to have rule in the world but now that rule will come to an end with the return of Christ. Other Futurists see this mystery as various truths about God and his purpose being revealed at the time of Christ's return. The sweet and bitter motif is seen to represent the word of God being a mixture of God’s message of grace and judgement. Fulfillment of events recorded here is seen as occurring in our future. 1-19: I was given a reed like a measuring rod and was told, "Go and measure the temple of God and the altar, and count the worshipers there. But exclude the outer court; do not measure it, because it has been given to the Gentiles. They will trample on the holy city for 42 months. And I will give power to my two witnesses, and they will prophesy for 1,260 days, clothed in sackcloth." These are the two olive trees and the two lampstands that stand before the Lord of the earth. If anyone tries to harm them, fire comes from their mouths and devours their enemies. This is how anyone who wants to harm them must die. These men have power to shut up the sky so that it will not rain during the time they are prophesying; and they have power to turn the waters into blood and to strike the earth with every kind of plague as often as they want. Now when they have finished their testimony, the beast that comes up from the Abyss will attack them, and overpower and kill them. Their bodies will lie in the street of the great city, which is figuratively called Sodom and Egypt, where also their Lord was crucified. For three and a half days men from every people, tribe, language and nation will gaze on their bodies and refuse them burial. The inhabitants of the earth will gloat over them and will celebrate by sending each other gifts, because these two prophets had tormented those who live on the earth. But after the three and a half days a breath of life from God entered them, and they stood on their feet, and terror struck those who saw them. Then they heard a loud voice from heaven saying to them, "Come up here." And they went up to heaven in a cloud, while their enemies looked on. At that very hour there was a severe earthquake and a tenth of the city collapsed. Seven thousand people were killed in the earthquake, and the survivors were terrified and gave glory to the God of heaven. The second woe has passed; the third woe is coming soon. The seventh angel sounded his trumpet, and there were loud voices in heaven, which said: "The kingdom of the world has become the kingdom of our Lord and of his Christ, and he will reign for ever and ever." And the twenty-four elders, who were seated on their thrones before God, fell on their faces and worshiped God, saying: "We give thanks to you, Lord God Almighty, the One who is and who was, because you have taken your great power and have begun to reign. The nations were angry; and your wrath has come. The time has come for judging the dead and for rewarding your servants the prophets and your saints and those who reverence your name, both small and great-- and for destroying those who destroy the earth." Then God's temple in heaven was opened, and within his temple was seen the ark of his covenant. And there came flashes of lightning, rumblings, peals of thunder, an earthquake and a great hailstorm. Preterists tend to see John’s measuring as symbolic of identifying those who would be protected from the imminent destruction of Jerusalem and reflective of what Christ said about Jerusalem being trampled down by the Gentiles in Luke 21:24. The temple is seen as the literal temple standing in the first century or symbolic of the spiritual temple of the church. The outer court is seen to represent apostate Israel. The forty-two months, as well as the 1,260 days, is seen as the period of time corresponding to the three and one-half years the Roman armies held Jerusalem under siege before destroying the city along with the temple. The account of the two witnesses is generally felt to symbolically represent the work of the church during this time of upheaval. The church is seen as being very proactive in spreading the gospel message but suffering great persecution and martyrdom. The saints are vindicated when Christ returns to bring the salvation promised and facilitate spiritual resurrection to all those who remained faithful. Some Preterists see the two witnesses as Peter and Paul who history indicates were both killed during Nero’s persecution. Peter and Paul are seen as being raised to spiritual life at the time the temple is destroyed signifying the end of the Old Covenant system of death and establishment of the New Covenant system of life. The “beast” is seen as representing Nero or the Roman Government in general. The earthquake is seen as representing the fall of part of the holy city Jerusalem. It is pointed out the historian Josephus writes of there being violent storms accompanied by the earth quaking during the war. This may provide some literal application to what John wrote. Christ is seen as establishing His spiritual Kingdom as He assumes rulership by bringing to termination the Old Covenant system and fully implementing the New Covenant system which provides for passing from spiritual death unto spiritual life. Resurrection is viewed as a passing from spiritual death unto spiritual life for those saints living when Christ returned and the physically dead saints being ushered into eternal life as well. The measuring John is told to do is seen in a similar fashion to that of the Preterists. The temple, however, is seen as a rebuilt temple at a yet to occur future return of Christ. The forty-two months and 1,260 days are generally seen to reflect the last three and one-half years of a seven year tribulation period yet future to us. Some Futurists see the two witnesses as Moses and Elijah or as two individuals coming in the spirit and power of Moses and Elijah much as John the Baptist was seen as coming in the spirit of Elijah. Others take a position similar to Preterists in believing they represent the witnessing of the church, but unlike Preterists, believe this event is still future. The “beast” is seen as a revived Roman Empire or its ruler. The resurrection of the witnesses is seen as a literal physical resurrection. The seventh trumpet is seen as the second coming of Christ to establish His millennial Kingdom on earth. Since a resurrection of the dead is indicated in this passage, it does present some problems for Futurists who believes that the saints were raptured before the tribulation and the rest of the dead are not resurrected until the end of the millennium. Some Futurists get around this problem by postulating that the resurrection occurring when Christ returns to establish His Kingdom is a resurrection of Old Testament saints, and those who turned to Christ and were martyred during the tribulation. This still allows for a final resurrection after the millennium. Another school of thought extant in some Futurist circles discounts the idea of a rapture before the tribulation but believes that the dead saints will be resurrected when Christ returns and rule and reign with Him during the millennium. After the millennium, those who never had a legitimate opportunity to accept Christ will be resurrected and given that opportunity after which there will be a resurrection of the incorrigibly wicked. 1-17: A great and wondrous sign appeared in heaven: a woman clothed with the sun, with the moon under her feet and a crown of twelve stars on her head. She was pregnant and cried out in pain as she was about to give birth. Then another sign appeared in heaven: an enormous red dragon with seven heads and ten horns and seven crowns on his heads. His tail swept a third of the stars out of the sky and flung them to the earth. The dragon stood in front of the woman who was about to give birth, so that he might devour her child the moment it was born. She gave birth to a son, a male child, who will rule all the nations with an iron scepter. And her child was snatched up to God and to his throne. The woman fled into the desert to a place prepared for her by God, where she might be taken care of for 1,260 days. And there was war in heaven. Michael and his angels fought against the dragon, and the dragon and his angels fought back. But he was not strong enough, and they lost their place in heaven. The great dragon was hurled down--that ancient serpent called the devil, or Satan, who leads the whole world astray. He was hurled to the earth, and his angels with him. Then I heard a loud voice in heaven say: "Now have come the salvation and the power and the kingdom of our God, and the authority of his Christ. For the accuser of our brothers, who accuses them before our God day and night, has been hurled down. They overcame him by the blood of the Lamb and by the word of their testimony; they did not love their lives so much as to shrink from death. Therefore rejoice you heavens and you who dwell in them! But woe to the earth and the sea, because the devil has gone down to you! He is filled with fury, because he knows that his time is short." When the dragon saw that he had been hurled to the earth, he pursued the woman who had given birth to the male child. The woman was given the two wings of a great eagle, so that she might fly to the place prepared for her in the desert, where she would be taken care of for a time, times and half a time, out of the serpent's reach. Then from his mouth the serpent spewed water like a river, to overtake the woman and sweep her away with the torrent. But the earth helped the woman by opening its mouth and swallowing the river that the dragon had spewed out of his mouth. Then the dragon was enraged at the woman and went off to make war against the rest of her offspring--those who obey God's commandments and hold to the testimony of Jesus. Most Futurists view the woman as Israel and the child as Christ. The women’s description parallels the description of the family of Jacob who became the nation of Israel (Genesis 37:9). Christ is easily identified as the child as it is Christ that is prophesied to rule all nations. The dragon is Satan as clearly identified in verse 9. The seven heads and ten horns are identified with a succession of revivals of the Roman Empire beginning with the Empire existing at the time the Revelation was written and extending to the time of Christ’s return yet in our future. The dragon casting a third part of the stars to the earth is seen as reflective of a third of the angels being cast to the earth at the time of Satan’s rebellion. The attempt of the dragon to devour the child is seen as Herod’s slaughter of the children in Bethlehem and the child being caught up to God’s throne is viewed as the ascension of Christ. The women fleeing into the wilderness is seen as a yet future event when spiritual Israel (the church) or a remnant of physical Israel flees to a place of safety (some think it to be Petra in Jordan) during the last three and one-half years of the tribulation or 1,260 days. The war in heaven is seen as occurring at the time of the tribulation and is reflective of Daniel 12:1 where Michael is seen as protector of the people. Satan having a short time is seen as Satan being active during the tribulation but facing banishment before the beginning of the millennium. The flood is interpreted in a variety of ways as is the dragon returning to make war with the rest of those that have the testimony of Christ. Preterists see the women crying out in pain as she gives birth as the culmination of the labor and pain of historical Israel awaiting the birth of the promised Messiah. The seven heads and ten horns are seen as a composite of the four beasts of Daniel 7 which had a total of seven heads and ten horns. This is believed to represent the four major empires of Babylon, Medo-Persia, Greece and Rome. Greece was split into four territories following the death of Alexander the Great. All these empires were under the sway of Satan. The dragon casting a third part of the stars to the earth and the attempt of the dragon to devour the child is seen in much the same light as that of the Futurist. Michael is believed to actually represent Christ as the one who casts out Satan. This event is seen as occurring at the time of the death and resurrection of Christ as indicated by Christ who right before His crucifixion said, “Now is the judgement of this world; now the ruler of this world will be cast out” (John 12:31). Once Satan is cast to the earth, knowing he has but a short time, he is seen as persecuting the woman who is viewed as the developing Christian church which is also viewed as spiritual Israel. This persecution goes on for approximately 40 years and leads to much suffering and martyrdom but Christians are seen as overcoming through Christ. The flight of the women into the wilderness during the 1,260 day period is seen as the escape of the Jerusalem Christians to Pella before the destruction of Jerusalem by the Edomite and Roman invasions during the three and one-half year siege of the city. This is seen as a direct response to Christ’s command in the Oliver Discourse to flee when they see the abomination that causes desolation standing in the holy place. Being carried by the wings of a great eagle is felt to be the anti-type of ancient Israel being carried out of Egypt on eagles wings (Exodus 19:4). Jerusalem is seen as a type of Egypt in Revelation 11:8. Satan casting out a flood to destroy the women is paralleled to the Egyptian Pharaoh attempting to destroy the fleeing Israelites only to be thwarted in doing so. Satan enraged at the women and making war with the rest of her offspring is seen as the continuing persecution of Gentile Christians scattered throughout the Roman Empire. 1-18: And the dragon stood on the shore of the sea. And I saw a beast coming out of the sea. He had ten horns and seven heads, with ten crowns on his horns, and on each head a blasphemous name. The beast I saw resembled a leopard, but had feet like those of a bear and a mouth like that of a lion. The dragon gave the beast his power and his throne and great authority. One of the heads of the beast seemed to have had a fatal wound, but the fatal wound had been healed. The whole world was astonished and followed the beast. Men worshiped the dragon because he had given authority to the beast, and they also worshiped the beast and asked, "Who is like the beast? Who can make war against him?" The beast was given a mouth to utter proud words and blasphemies and to exercise his authority for forty-two months. He opened his mouth to blaspheme God, and to slander his name and his dwelling place and those who live in heaven. He was given power to make war against the saints and to conquer them. And he was given authority over every tribe, people, language and nation. All inhabitants of the earth will worship the beast--all whose names have not been written in the book of life belonging to the Lamb that was slain from the creation of the world. He who has an ear, let him hear. If anyone is to go into captivity, into captivity he will go. If anyone is to be killed with the sword, with the sword he will be killed. This calls for patient endurance and faithfulness on the part of the saints. Then I saw another beast, coming out of the earth. He had two horns like a lamb, but he spoke like a dragon. He exercised all the authority of the first beast on his behalf, and made the earth and its inhabitants worship the first beast, whose fatal wound had been healed. And he performed great and miraculous signs, even causing fire to come down from heaven to earth in full view of men. Because of the signs he was given power to do on behalf of the first beast, he deceived the inhabitants of the earth. He ordered them to set up an image in honor of the beast who was wounded by the sword and yet lived. He was given power to give breath to the image of the first beast, so that it could speak and cause all who refused to worship the image to be killed. He also forced everyone, small and great, rich and poor, free and slave, to receive a mark on his right hand or on his forehead, so that no one could buy or sell unless he had the mark, which is the name of the beast or the number of his name. This calls for wisdom. If anyone has insight, let him calculate the number of the beast, for it is man's number. His number is 666. Most Futurists associate the beast rising up out of the sea with the forth beast of Daniel seven which is commonly understood to represent the Roman Empire and consists of an amalgamation of the first three beasts seen by Daniel. Many commentators view scripture as designing the sea as representative of Gentile nations and land as representing Israel. Dispensationalist futurists see this beast as representing a revived Roman Empire yet to occur in our future. The deadly wound is seen as an actual resurrection of a leader of the beast power or as symbolic of the Roman Empire of old being revived. The period of forty-two months is associated with the last three and one-half years of the tribulation to occur just before a yet future second coming of Christ. The little horn is associated with the little horn of Daniel seven and is viewed as the rise of a religious leader who will be in alliance with the beast power. This religious leader is viewed as the “antichrist,” the man of sin mentioned in 2 Thessalonians 2:4. Many futurists see the image of the beast as a literal image that the religious leader will cause people to worship. The mark of the beast is often viewed as some kind of identification required in order to but and sell. No definite application is given to the number 666 by futurists. Because this number has been seen to apply to various individuals throughout history, futurists are reluctant to take a stand on this issue. Some Futurists take a historicist approach and see the first three beasts of Daniel seven as representing the Babylonian Empire of 625 to 538 B.C., the Medo-Persian Empire of 558 to 330 B.C., and Greece under Alexander the Great which began in 333 B.C. After the death of Alexander, Greece was divided into four kingdoms which are felt to represent the four heads of the third beast. Rome became the seventh beast (seventh head) of Daniel seven and existed from 31 B.C. to A.D. 476. This seventh head of Daniels beast is the beast John sees in Revelation thirteen. The deadly wound is seen as the fall of Rome in 476 A.D. and the first three horns are seen to represent the transition rulership of the Vandals (A.D. 429 to 533), the Herulli (A.D. 476 to 493) and the Ostrogoths (A.D. 493-554). The deadly wound is seen as being healed by the restoration of the Empire under Justinian in A.D. 554 who is seen as the fourth horn. The Empire is seen as experiencing four more restorations and continuing until 1814 which is seen as the period of forty-two months from the beginning of the Roman Empire in 31 B.C. or 1,260 years based on the day for a year interpretive methodology. Horns five through seven are explained in the commentary on chapter seventeen. Preterists identify the Roman Empire as the beast having the seven heads and ten horns. This Empire represents the seventh head of Revelation 12 and Daniel 7. The ten horns are felt to represent the ten provinces of Italy, Achaia, Asia, Syria, Egypt, Africa, Spain, Gaul, Britain and Germany over which Rome ruled. The first five heads are seen as Julius Caesar, Augustus Caesar, Tiberius Caesar, Caligula, and Claudius Caesar with Nero being the sixth and the one John sees in power at the time. This is seen as corresponding with the seven headed, ten horned beast of Revelation 17:9-10, where the beast is identified as seven kings of which five having fallen, one is, and the other has not yet come. The one that is, is felt to be Nero. It’s pointed out that when Nero committed suicide, the Empire was thrown into great disarray involving civil war and anarchy. Three would-be successors to Nero failed and died within the space of eleven months. The Empire appeared to be coming to an end when General Vespasian, at the insistence of his army, took control of the government and brought the empire back from oblivion. It was Vespasian’s son Titus who led the siege against Jerusalem. In the historical overview of the Roman Empire given to John, some Preterists see this revival of the Empire as the deadly wound that was healed. Preterists point out that Nero’s full title name as Roman Emperor was Nero Caesar. In Hebrew and Greek, the numbers associated with these letters total, 666. It’s pointed out that in several very early copies of the Greek New Testament; the number 616 is given which is the Latin numerical equivalent of the name Nero Caesar. It is believed this tells us the copiers knew 666 in the Greek represented Nero and were simply using the Latin numerical designation they were well aware of. The forty-two months is associated with the Neronic persecution against the Christians which began in November of A.D. 64, and continued until June of A.D. 68, a period of three and one-half years. It was in June of A.D. 68 when Nero committed suicide. Worship of the beast is seen as reflective of Caesar worship which was common throughout the Roman Empire. History reports that Nero built a 120 foot high likeness of his head haloed with solar rays that identified him as Phoebus Apollo. Some Preterists view the “little horn,” that arises from the land, as the Jewish religious authority. It’s pointed out that many New Testament scriptures speak of the Jewish hostility toward Christians and their complicity with the Romans in persecuting and putting Christians to death. It is felt that this persecution included attempts to prevent Christian’s from buying and selling if they refused to express allegiance to Rome. At the trial of Christ the Jews said they had only one King and that was Caesar.